You are here: Home › Power › Why are we bothered about power? What would help us to challenge? Why are some people listened to and others not? The ensuing discussion may include conversations about status, gender, discrimination, disadvantage, lack of confidence, bullying, manipulation, lack of knowledge about where to go to get the information we need. Already we can see that the balance of power is dependent on many different things and that conversations about influence can become very complex very quickly! If you are working with any of the frameworks in the Axis of Influence series it is vital to have an understanding of power and how it ‘fits’ into conversations about influence, so that you are prepared for the discussions that may take place. All of the frameworks in the Axis of Influence series are concerned with influencing in empowering ways. This makes it important to explore what we mean by ‘empowering’. It is one of those words which we all use (and which many use in a casual throwaway fashion) but rarely ask each other about. There are often assumptions that we know what it means and very little rigour to ensure that it actually happens. Quite often an easier starting point is for people to consider what we mean by ‘disempowering’ ways of working and trhat feels. When we ask people what makes them feel disempowered, they say things we can relate to, for example: people not listening, finger-pointing, being put down, bullying, impenetrable bureaucracy. It is not hard to imagine how they feel: that they can’t be bothered, de-motivated, angry, depressed, worthless. The next step can be to think about how organisations and structures themselves can be disempowering to both their staff and those they are serving in some way or other. Frameworks in the Axis of Influence series prompt conversations about disempowering behaviour and organisational structures – which in turn raise questions like: who has the power to change these? In whose interests is it to change these? You need to be prepared for this. People representing organisations and their members on partnership boards, for example can get caught between what they really want to say and what will be heard by other people. 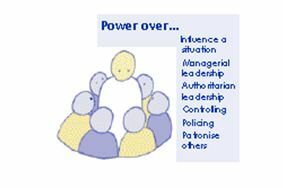 In this scenario, they are trying to maintain their own power and the power of their organisation, whilst recognising and working with other people’s power. 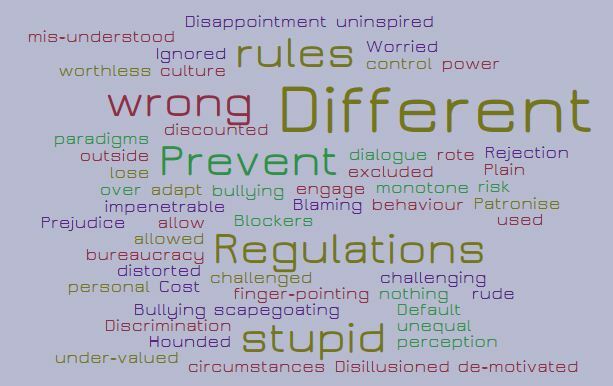 For people working in the voluntary sector this experience can be recognised as what some have called the ‘tempered radical’, a term which recognises the tension between speaking out and conforming. 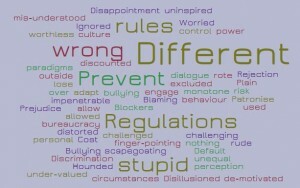 People working in the public sector can feel stuck too. For example, staff whose job role is specifically about supporting communities to influence their organisation. Perhaps a Police Authority which employs community engagement officers to support ‘local liaison groups’ to influence the policing plan. Is the Authority really geared up to listen and respond? Is the officer ‘biting the hand that feeds’? In workshops focusing on different frameworks in the Axis of Influence series, we often look at a couple of definitions of ‘power’ to prompt debate. 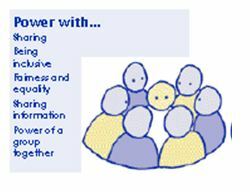 Having an understanding of, and healthy interest in, ‘power’ is an essential part of understanding how influence happens, and in supporting others to engage with the whole ‘influence’ agenda. Also there are political power, economic power, charismatic power and so on. Some people think that all that stops us are the limits we place on ourselves. Others think that what we can achieve is shaped by society; individuals are limited by things which are bigger than one person. The more realistic position is somewhere in the middle; we have some choices and these are always limited by the cultures, norms and structures in society. However, once there is a safe space to talk about these things, people start to recognise it’s ‘not just me’- there are patterns, explanations and analysis to be considered and explored.